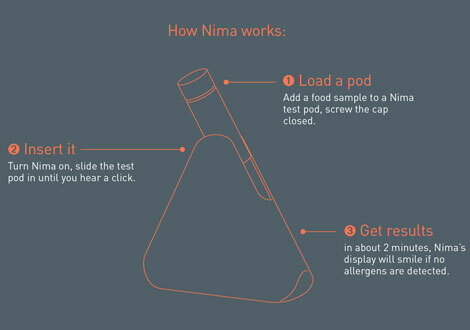 The Nima Sensor will tell you what has gluten, peanuts, and dairy in it so your server doesn't have to. The sensor, created by former MIT students at 6SensorLabs, can test your food for allergens in just two minutes, and is small enough to fit inside a purse or pocket. Nima is visually discrete—it looks a bit like a makeup compact—and it doesn’t rely on messy test tubes like other allergen sensors. The triangular device works like this: you insert a small amount of food into a disposable tube, which you then insert into the body of the machine. Nima then tests the sample and lights up with either a smiley face (for all clear) or a red light (to indicate the presence of gluten). “Right now, the company is working on adapting the technology to test for peanuts and milk, both leading allergens in the United States,“ according to PSFK. Nima will be releasing prices for its devices and accepting pre-orders by the end of the year. They’re aiming to get the device into the hands of consumer by early 2016.